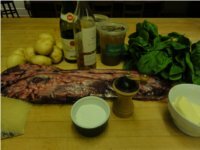 Here is the most delicious, elegant beef dish for the holidays or other special occasions! 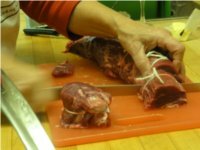 To prepare the meat, remove all the fat and the silver skin from the tenderloin, leaving the large sirloin piece attached and removing the long thin muscle called the chain. Discard the fat and silver skin. 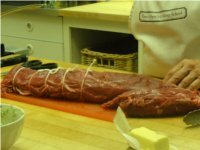 Tie the tenderloin at 2-inch intervals, and cut into 1 1/2 inch steaks. Season with salt and pepper. To make the essence of beef, cut the chain (the meat trimmings) into 1-inch cubes. Heat a 12-inch heavy skillet or saute pan with enough oil and butter to lightly coat the bottom. Carefully, place the squares of meat around the bottom of the pan. Brown the meat on all sides, turning with tongs, and being careful not to burn the sediment on the bottom of the pan. When all the meat has been browned, add about one-fourth of the stock and reduce over medium high heat. Repeat adding stock until the essence thickens. Strain the essence through a fine sieve into a measuring cup, capturing any remaining stock by adding 1/2 cup water to the pan, and pouring it over the pieces of meat. To prepare the compound butter, beat the butter in a bowl with a wooden spoon until light. Add the minced herbs, with salt and pepper to taste. When ready to serve, panfry the filets over medium high heat until medium rare, or slight resilient when pressed with your finger. Remove from the pan and keep warm. Into the pan, pour the Cognac and boil up. Stir in the red wine and continue to reduce. Stir in the essence (the strained meat juices) and boil up again. Taste and adjust the seasoning. (If thickening is needed, whisk in a mixture of equal amounts of butter and flour or arrowroot dissolved in cold water until desired consistency is reached.) Serve the steaks on individual plates surrounded by the red wine sauce, and with a teaspoon of the herb butter on top. 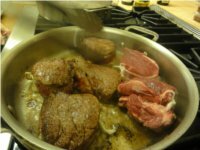 Note: You can payfry the filets ahead until well browned and place them on a baking pan. Then, 10 minutes before you are ready to assemble them put them in a preheated 450 oven to finish cooking. Be sure to add any accumulated juices to the red wine sauce. 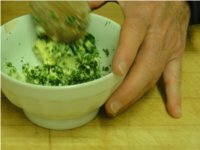 And, you can omit the herb butter if you like. 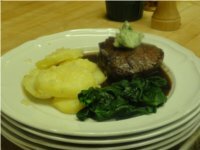 I recommend serving these filets with individual potatoes gratin and fresh spinach, making sure the red wine sauce runs under the spinach. Put the potatoes in a large pan, covered with plenty of cold water (or milk). Add a tablespoon of salt. Bring to a boil over high heat and cook until the potatoes are tender when pierced with a fork. 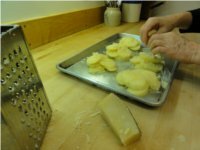 Drain the potatoes in a colander and shake out the excess moisture. cheese is lightly colored, about 15 minutes. 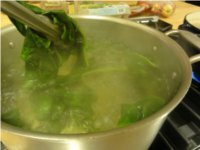 To serve this with spinach, simply drop about half a bunch of spinach per person into boiling salted water. 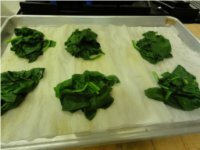 When the spinach is half wilted, remove it clumps from the water and place individually on a pan lined with paper towels. The whole pan of spinach bundles can be reheated for 3 minutes and then served.